Visiting scholars bring cultural and professional perspectives that enrich mutual understanding and application of innovations and quality standards in digestive disease care. The Digestive Disease Institute (DDI), building on its education and research mission as well as on Virginia Mason's mission to be the Quality Leader and transform health care, welcomes colleagues whose work in digestive disease relates to the expertise of a DDI provider and can be fostered through a 45 day to year-long visiting scholar appointment. Visiting Scholars at the Digestive Disease Institute are onsite for training, educational observation of patient care and research activities such as hypothesis generation, IRB submission, abstraction and analysis of data, and manuscript preparation and submission. Visiting Scholars do not provide clinical services. 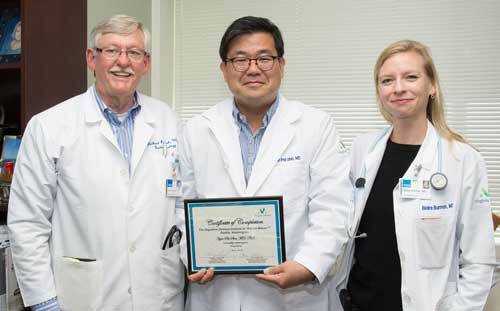 Digestive Disease Institute Visiting Scholars Jong Jin Hyun, MD, PhD, Andrea Wirsching, MD, and Kyung Ok Kim, MD. Applicants must hold a current medical or professional license, provide a current Curriculum Vitae (CV), a statement of goals, three letters of recommendation, and if invited, secure their own visas for the duration of the visiting scholar appointment. Note: Virginia Mason does not sponsor J-1 visas. Proposed goals must be compatible with DDI's mission and focus exclusively on observation and research activities, such as abstracting and analyzing data, drafting and revising manuscripts for publication, deliberating on methodological approaches, and the like. Visiting scholar appointments may not involve patient care of any kind. Excellent English language skills are a critical factor for a visiting scholar's ability to participate fully in the intellectual and observational opportunities of the DDI community. We regret that not all applicants to the Visiting Scholar Program will be accepted. Acceptance is contingent upon multiple considerations, including availability of space, identification and agreement of an appropriate sponsor, and approval of Fit for Duty requirements. The visiting scholar requires sponsorship from a Virginia Mason provider. The sponsor is responsible for the day-to-day activities of the visiting scholar, serves as the main contact point for the visiting scholar during his/her time, and provides mentorship and guidance to the resources and networks available as part of the DDI. The sponsor works with the visiting scholar as an intellectual collaborator and meets regularly with the visiting scholar to help achieve his/her educational, observational and research goals. Access to a specific sponsor is subject to the provider's availability during the requested time frame. Visiting scholar appointments are minimally 45 days. No visiting scholar appointment shall be longer than a 12-month period. Extensions of appointments are subject to approval by the DDI Executive Director and Director. Visiting scholars with appointments of three months or longer are expected to draft a manuscript on Virginia Mason research/clinical results, ready for submission to a peer-reviewed journal, by the end of every third month of appointment. Following a research timeline, year-long visiting scholars are expected to lead authorship of at least three publications on Virginia Mason research/clinical results in peer-reviewed journals per year, co-authored with their sponsor or designee, and make a presentation on their research at a minimum of one national or international meeting. All expenses, including, travel, housing, supplies, long-distance calls, photocopying, statistical consultations, secretarial services, transportation and parking related to the visiting scholar appointment must be sustained by and are the sole responsibility of the visiting scholar. The DDI does not provide any monetary funding or wages for visiting scholars. The visiting scholar must have provisions to meet all of their expenses during their time in Seattle. A shared desk on site may be provided to visiting scholars as space allows. Space on site is not guaranteed. Hyun Phil Shin, MD, a 2015 Digestive Disease visiting scholar and associate professor from Kyung Hee Hospital at Gangdong, University of Kyung Hee School of Medicine in Seoul, Korea, in between Richard Kozarek, MD, and Blair Burman, MD. A maximum of three DDI visiting scholars may be appointed at any one time. Visiting scholars are responsible for their own housing arrangements. The Digestive Disease Institute assumes no financial responsibility for housing and does not guarantee housing of any kind. Virginia Mason is located in Seattle's Downtown/First Hill neighborhood. Potential visiting scholars may wish to seek housing/rental information from The Seattle Times and/or consider short-term accommodations at The Baroness Hotel.